Veterans Awareness Month is a time to remember, a time to say thank you to those who have served our country. But for many their struggles are not over. Their battles are not yet won. Show them that you care and provide a reassuring reminder of faith and family in troubled times. 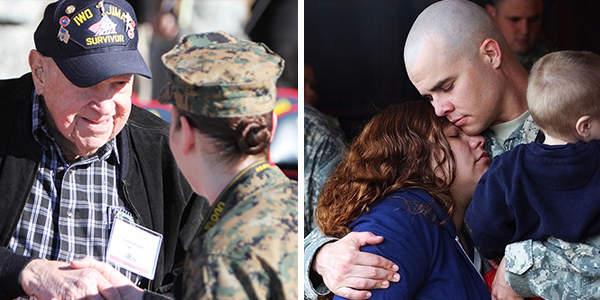 Many of our veterans, active military and their families are fighting their own personal wars. Please help us provide them with hope for today so that they can have the possibility of a brighter tomorrow. Provide hope and comfort to a veteran or active member of the U.S. Armed Forces with a gift subscription to Guideposts. Your gift can help sustain military men and women and their families with heart-lifting stories of human kindness and true stories of how the power of faith can change lives. 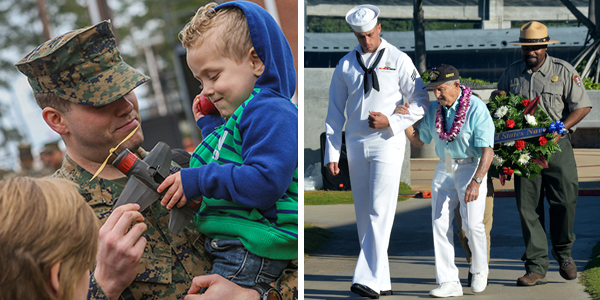 Donate to the Guideposts Military Outreach program and you’ll bring hope and inspiration to help sustain our veterans, active military and their families. With your generous donation we can continue to provide free inspirational literature to military bases and VA medical centers around the world. "I was in the service in 1967, stationed in Vietnam, when I received my first Guideposts. Every month I looked forward to getting Guideposts and sharing it. Recently I read a story about how Guideposts supports our troops by sending them magazines free of charge. I thought of an injured soldier, a young man seeing that little magazine for the first time, and what it could mean to him. I got out my checkbook and wrote a check for $20. I couldn’t think of a better way to thank my old Army buddies." - Edward L.
"Please accept our heartfelt gratitude for the Guideposts magazines and the Christmas cards. Our veterans appreciate knowing that there are those willing to make their holidays brighter and more enjoyable." - Christopher S.
"I cannot express the gratitude from myself and the servicemen and women over here in Iraq. Thank you very much for your support. "- Adam M.
"I served our great country in Korea where I was almost taken prisoner of war. I still experience the horrors of war every single day through intrusive thoughts and nightmares. But there is something that brings me peace despite onslaughts to my serenity. Something I can depend on to bring me hope and joy… Guideposts and Daily Guideposts. One of God’s greatest gifts to veterans and those they hold dear. "- Howard F.
"Thank you for the many useful resources you have given us to hand out to our airmen and others going through tough times. They have meant a lot to our unit and we really appreciate your support. "- Tim S.
Please help make a difference in the lives of our veterans, active military and their families with messages of hope and inspiration to help sustain them through their own personal wars. Provide hope and comfort to a veteran or active member of the U.S. Armed Forces with a gift subscription to Guideposts. Your gift can help sustain military men, women and their families with heart-lifting stories of human kindness and true stories of how the power of faith can change lives. Please accept our sincerest thank you. Your thoughtfulness will make a difference in the lives of our veterans, active military and their families. Your kindness and generosity is appreciated more than you can imagine. "And may the Lord reward you for your kindness..."